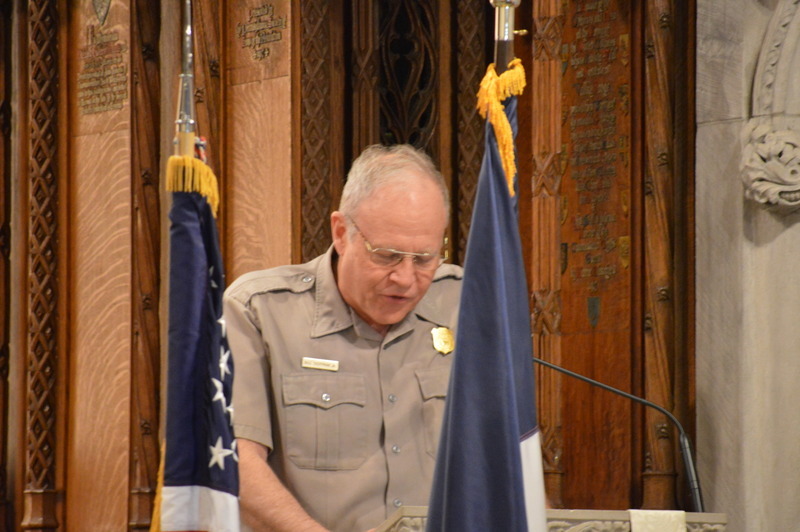 On behalf of the National Park Service and Park Superintendent Kate Hammond, it is an honor to welcome you to the annual French Alliance Day celebration. The Commander in Chief directs that divine Service be performed every Sunday in those Brigades to which there are Chaplains. It is expected that officers of all Ranks will set an Example to their men – While we are zealously performing the Duties of good Citizens and Soldiers we certainly ought not to be inattentive to the higher Duties of Religion – To the distinguished Character of Patriot’s it should be our higher glory to add the more distinguished Character of Christians. Please permit a quick personal note. My French Huguenot forebears – on my Mother’s side – arrived in New Rochelle, New York in 1687, and settled in New Jersey. Almost a century later, they served the infant United States during the American Revolution. This afternoon we celebrate the Alliance between France and Unites States. That alliance is best reflected by the close and firm friendship between two great men; George Washington and the Marquis de Lafayette. The commander-in-chief responded the very next day: Your words of yesterday conveyed to me fresh proof of that friendship and attachment, which I have happily experienced, since the first of our acquaintance, and for which I entertain sentiments of the purest affection . . . I have no doubt that everything in life happens for the best, that we shall triumph over our misfortunes, and, in the end, be happy; when, my dear marquis, if you will give me your company in Virginia, we will laugh at our past difficulty and the folly of others. Throughout the war Lafayette sent a stream of letters to Versailles and Paris, urging everyone he knew of influence to support America. In very word, he later wrote, I did everything to draw our two peoples together. 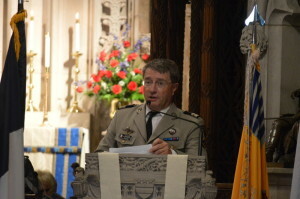 First I would like to express the regrets of General Bruno CAITUCOLI, who had to cancel his participation to the glorious French Alliance Day in the Washington Chapel, because of last minutes duties and visitors from France. But then, I cannot help to think how fortunate this makes me, since I now have the honor to represent him and the French Republic, and even more importantly to find myself amongst old friends. As the Commanding Officer of the small contingent of French Army Reserve Officers in the USA, I present myself to you in uniform. 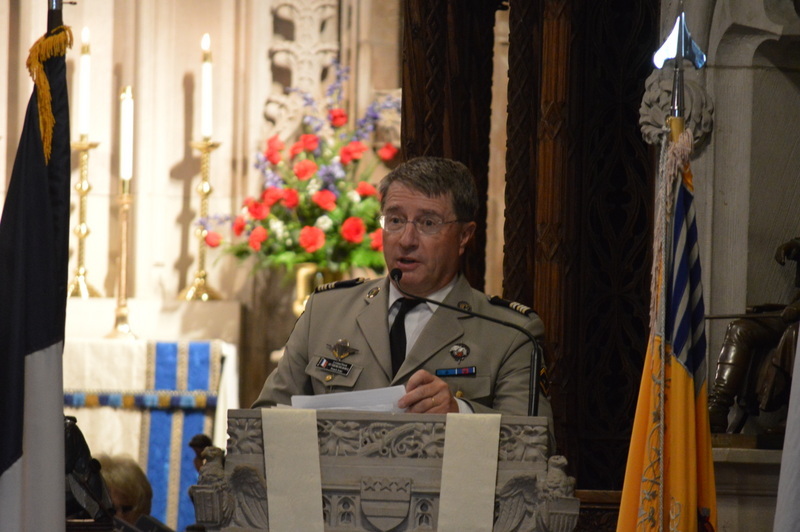 This French uniform which I proudly wear in your Country reminds me of the primary mission of my command here in America. To be qualified and available at all times as a liaison officer between our two armies and to fight side by side with our American brothers. As you can see, much has changed since 1776, the uniforms, certainly; much have grown in power and intensity; but the spirit remains the same. I also appear to you as the Co-President and Co-Founder of “The French Will Never Forget”, an association dedicated to demonstrating the love and gratitude of the French people for the decisive help of America in the past century. And here I am, as a guest of honor, in a glorious commemoration, which could as well be labeled “The Americans Will Never Forget”. The extraordinary thing here, that needs to be kept in perspective, is that YOU have carried on the tradition and kept the flame of remembrance and friendship alive for 235 years. This is admirable and this is very humbling. So, who exactly do the two organizations remember and honor? Well, we both remember heroes from “the other side”. On the American side you remember, amongst many others, Francois-Louis Teissedre de Fleury who volunteered in 1777 and joined the Continental Army, paying his own way. He fought in most of the major battles: Piscataway, Brandywine (where incidentally Lafayette was wounded), Germantown (where he was wounded), Fort Mifflin (where he was wounded again), Monmouth, Rhode Island, Stony Point (where he was the deputy CO of the 1st Regiment; became the highest ranking officer and acting CO of all the Revolutionary Forces in the course of the battle; led his Franco American troops to victory; was first over the enemy lines and at the flag pole, where he cut the British colors from their staff, signifying the capture of the fort; a feat Washington himself did not think possible), and finally at the battle of Yorktown. For his exploits a medal was created in his name (some say the very first medal created by the new American Congress), and to this day it is a prized awards in the Army Corps of Engineers. On the French side we remember amongst countless others Marion Gray. Marion Gray was a medic, a staff sergeant with the 116th Infantry Company A. He was in the very first wave which hit the sand of Omaha Beach in France, on a certain June 6 1944 around 6:30am. As soon as the ramp of the landing craft is deployed, he is immediately caught under a cataclysmic enemy fire. He sees his comrades mowed down, right in front of him. He jumps and struggles ashore with bullets and shrapnel killing many of his comrades all around him, while still in the water. He sees many, just drowning: too deep, too much surf, too heavy a load. Once on land he desperately seeks the most minute protection against the unforgiving volley of lead. The noise is terrifying. Wounded comrades are all around him; they scream in pain, they scream for help. Marion Gray is a medic. He has to go help them. With a knot in his stomach he leaves the meager tiny shelter he had found for himself. He crawls to the first batch; he does whatever he can, concentrating on the “salvageable ones”. A tourniquet here, a dressing there, and morphine… a lot of morphine. He is hit, a first time… But other comrades keep screaming for help. They stand a little further… He hurts but he has to go… He leaves all his gear, and armed only with his helmet and his medical supplies he continues, and again crawls under weathering fire. He is hit again… but the screams keep coming, so he keeps going. He reaches them, starts to administer first aid. At some point his own suffering becomes so intense he looks for morphine to administer some to himself. None is left… he delivered his entire stack already. He passes out, he believes it is from the pain; in fact a mortar round fell right by him shattering part of his left arm. When he wakes up in the hospital he learns that out of the 170 soldiers from his Company, by the end of the day only 15 were unscathed and able to continue fighting, 64 were wounded, and 91 were killed in action. Of course I do not know François-Louis Teissèdre de Fleury, but I do feel a kinship to him. I do know Marion Gray. I met him two years ago. I was representing the French Army; he was receiving the French Legion of Honor. At the end of the ceremony we sat down and shook hands; he did not let go of his grip. And so we spoke, pressing hands. At the end I just could not resist, I had to ask him: Did he see the movie “Saving Private Ryan”? A tiny hesitation, then his eyes teared up a little and focused on mine, and the answer, the terrible answer comes out: “that was exactly like in the movie”. The handgrip becomes a bit stronger, a little less frail; it is as if he finds himself back on the beach, struggling to survive, with the urgent need to harness all his strength. It was then my turn to tear up a bit. And so we were, for a brief moment, me in my Class A uniform, him in his Veteran WWII uniform, pressing hands, both with red eyes, remembering together… celebrating the Alliance together. And Marion Gray together with 16 millions other Americans, on all theaters, did just that, including the 180,000 who made the ultimate sacrifice for the liberation of Europe. So where did all this sacrifice left us, and what is the health of the Franco American alliance today? At the political level I am told things could not be better. President Hollande completed a very successful state visit to the United States earlier this year; the first state visit of a French president to the USA in nearly 20 years. On the diplomatic and security front, the U.S. and France are each other’s closest allies in the fight against terrorism. One example amongst many others has been France’s military operation in Mali, at the heart of Africa, to combat al-Qaida, with, by the way, much-appreciated American support in terms of logistics and intelligence. Another is the close cooperation between the United States and France to prevent Iran from becoming a nuclear weapon state. The U.S. is France’s largest commercial partner outside the European Union, and cross- investment is the backbone of our economic partnership. France is one of the top five foreign investors in this country with 3,000 French companies supporting more than 600,000 American jobs. Conversely, the U.S. is the number one foreign investor in France. And by the way, American investment to France is on the rise again, which is good news. NATO remains an unmatched alliance, an anchor of stability. That is one of the reasons why France rejoined NATO’s military command structure a few years ago, and as the Obama administration is encouraging us to establish a stronger European pillar within NATO. And by the way, it is important to remember that France and Britain together account for more than 60 percent of the total military spending of the 28 members of the European Union. Now, the critical importance of the trans-Atlantic partnership also holds true on the economic front, where Europe and America remain the anchor of the world economy. Together they account for nearly 50 percent of the world’s GDP, a third of international trade and about two-thirds of the world’s innovation process. Moreover, 15 million jobs on the two sides of the Atlantic are directly linked to the trans-Atlantic trade and cross-investment — yes: 15 million jobs. And what about the people, and the perception of one another? According to PEW Global survey about 2/3rd of French People have a favorable or very favorable opinion of the United States. About the same percentage found in Canada and in Australia. In Europe France is only second to Italy, and well ahead of Germany and Great Britain. The USA is clearly one of the best loved countries by the French. Interestingly a similar survey by PEW shows France in 7th position with 59% of favorable opinion within the American public. Pretty good; but it could be better: Canada ranks first, at 81% – Great Britain 2nd at 79% – Germany 4th at 67%. Remember the figures I stated above – It seems like the perception of France is still suffering from the fallout that resulted in 2003 from the difference in analysis of the situation in Iraq, between the two countries, and the subsequent refusal from France to join in the operation Iraqi freedom. So the overall relationship between the two countries is excellent, and the relationship between the two people is very good. You are, in Valley Forge, thriving to make it from Very Good to Excellent; and this every year for 235 years. My profound respect and gratitude go out to all of you for this. We are with “The French Will Never Forget” thriving to the same goal. Most of you were here last year and eared of our past efforts to do just that. At the end of the service I will be honored to show the movie on the 10th commemoration of the tragedy of 9/11 we held in Paris on Sept 11, 2011. I could only mention it last year. The movie was not produced yet. My son William will be happy to distribute a complementary DVD to each of you. Although it has the same cover as the Omaha beach event you received last year; it is not the same. This one includes the two movies. So please make sure to take one. As for this year: At “The French Will Never Forget” we will continue to make sure that America knows of our gratitude and of our friendship. We are working on a spectacular event over Lady Liberty on June 6, for the 70th Anniversary of for D-Day. With cooperation from the French Navy we are planning to drop one million rose petals over the Statue of Liberty; the symbol of freedom which we all cherish and that we have in common. This represents about 500 petals per US soldier who made the ultimate sacrifice on D-Day; and I know that deep down in my heart…..
… I will reserve a few petals for Staff Sergeant Marion Gray. Thank you all, and may God bless America and the French American friendship forever.